Digital oscilloscopes have entered an epoch-making generation. 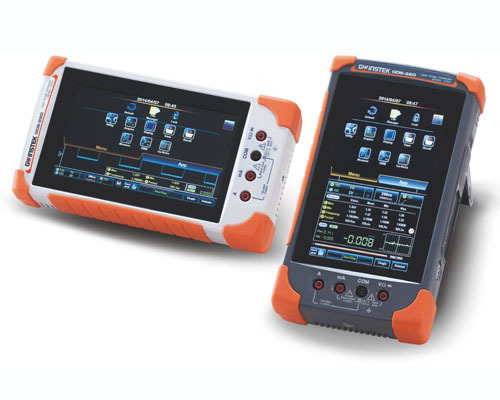 Compact appearance, full touch screen, and abundant functions together make this exquisite oscilloscope a very powerful test and measurement instrument which tremendously facilitate engineers to solve complex challenges. This is the latest definition of the alluring- brand-new-generation oscilloscope defined by GW Instek. That is the reason why she is called the Angel of the Test and Measurement Industry. GDS-200/300 series oscilloscopes are equipped with USB storage function and can be positioned in portrait and landscape display. The recharging-battery design makes the series easy to operate for field operations. The GDS-200/300 series are applicable in laboratories, R&D, large electric system tests, power product tests, motor tests, solar power battery inspection and repair, and maintenance personnel who are always on field assignments. The GDS-200/300 series, with two analog signal input channels, have advanced and standard models which come with 70MHz, 100MHz and 200MHz bandwidth. The maximum sample rate per channel is 1GSa/s and memory depth is 5Mpts. GDS-300 series oscilloscopes are equipped with 50,000 counts DMM, and GDS-200 5,000 counts DMM which can simultaneously measure and monitor A.C. and D.C. voltage and current, and temperature. Trend plot in a long period of time can also be drawn that allows engineers to effectively monitor standard electric parameters while measuring basic circuit signals. Optional 40 MHz dual-channel differential probe can achieve equivalent isolation results for measurement system under strict power and grounding environment. Users can also easily apply the oscilloscope as a very convenient USB storage equipment to store waveform images and raw data. Additionally, the oscilloscope can be connected with smart phones to transmit the recorded data. Engineers are aware of GW Instek oscilloscopes’ thoughtful designs through diversified application software. Advanced DMM function and GO/NOGO template editing facilitate users in conducting advanced diversified measurement functions. Engineering calculator, attenuation calculation analysis, and resistance indication analysis help users apply auxiliary functions that demonstrate the concept of powerful and comprehensive technological integration. GDS-200/300 series oscilloscopes’ built-in temperature measurement and logging function allows users to conduct systematic temperature measurement and logging for electric components and electric systems. This function can collocate with different temperature measurement probes. B,E,J,K,N,R,S,T thermal coupling measurement probes are also supported to conduct Celsius and Fahrenheit scaled temperature measurement. Users can also use trend plot editing to conduct temperature monitoring in a long period of time. It is a simple and convenient measurement tool for quality assurance and test departments.